The big diesel purrs as we cruise along four miles off Kawaihae. Three volcanoes dominate the horizon, and tradewinds curve around the northwestern tip of Hawai‘i Island. Our boat closes in on what resembles a surfboard with a short mast, navigation lights, two antennas and solar panels. This is the “float”: the surface portion of a marine robot developed here on the Kona coast. Tony San Jose, who’s leading our outing, signals us to don our snorkel gear as the boat pulls alongside. We slide over-board and gaze into the indigo abyss, then swim to the float and grab onto its handles. This is a Wave Glider—number sixty-three out of some four hundred built to date—and it’s been hovering out here for months. I pick off a soft, young barnacle growing on the underside. “Those are a delicacy in Spain,” Tony quips. The Wave Glider is an autonomous robot, powered by waves and solar energy, that collects and transmits data about the ocean in real time. It was created by Sunnyvale-based Liquid Robotics. 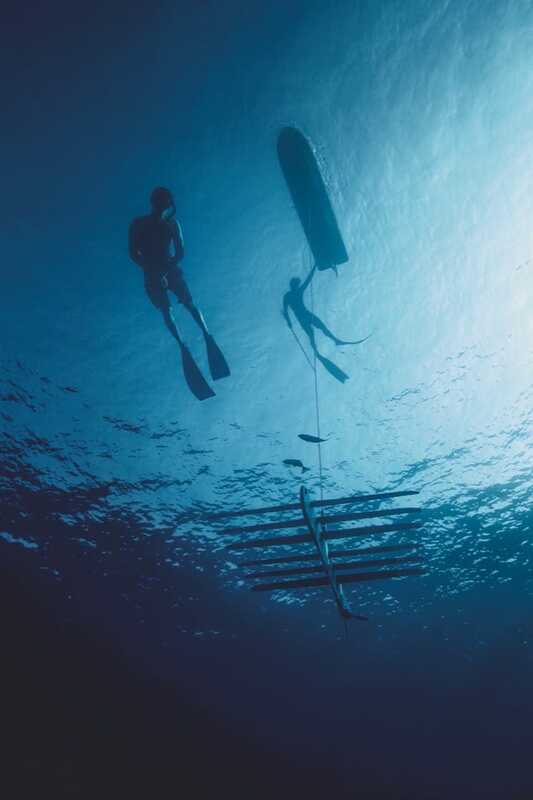 Hanging twenty-four feet below the surface float and connected by a black umbilicus is the “sub,” a narrow contraption with twelve horizontal fins. As waves lift the float at the surface, the attached sub gets tugged up and down, causing the fins to undulate. This creates propulsion by which the sub tows the float. The sub is equipped with a rudder and a battery-powered thruster to provide a boost whenever the sea is dead calm or the glider encounters a strong current. Guided by satellite and harnessing the ocean’s energy, a Wave Glider can stay at sea for up to a year and cross oceans without consuming fuel or producing any emissions. And Wave Glider is just one of several marine robots that have been revolutionizing ocean exploration and research in the last ten years. Engineer Billy Middleton flutter-kicks effortlessly down and clings playfully to the sub. The float pulls us along as it traces lazy circles, holding station within a small, GPS-defined pixel of the Pacific. If the robot wanders, satellite commands will return it to its box. Within a mile or so are six other Wave Gliders, each assigned to its own square by Liquid Robotics. Founded in 2007, Liquid Robotics was acquired by Boeing in 2016 and most of its operations moved from Hawai‘i to Sunnyvale, California. But Kawaihae remains its testing ground. Personnel from government agencies and other clients, including the US Navy, come to the Islands for courses in operating the gliders they’ve purchased. Base model costs around $250,000 (more with custom instrumentation). At its start Wave Glider wasn’t the sophisticated robot it’s become. In 2003 Joe Rizzi, an engineer and former Silicon Valley venture capitalist, was trying to record the songs of the humpback whales that winter around Hawai‘i. But the hydro-phones he’d affixed to buoys kept breaking loose. Rizzi needed something better, an “unmoored, station-keeping data buoy,” as he describes it. A small tech team led by Roger Hine, whose background is in engineering as well as robotics, took on the challenge, embarking on what would be a two-year period of trial and error. Hanging on the wall of the shore facility at Kawaihae are funky, weather-worn components of early Wave Gliders. Instead of fins, “the first sub had double whale’s tails,” says Chuck Shaver, the longest-serving techie of the group. In the end Rizzi and Hine developed much more than a stationary floating listening device: Wave Glider could propel itself, even in rough seas, at up to two and a half knots. In 2009 a Wave Glider circumnavigated Hawai‘i Island. Then two of them crossed from Hawai‘i to San Diego in eighty-two days. It was a historic achievement: the first long-distance transit by an ocean robot relying on renewable energy. I first came across autonomous marine technology in November 2013, at the Kaneohe Yacht Club on O‘ahu. Hunched over the hatch of a nineteen-foot, life-jacket-orange sailboat was none other than Richard Jenkins, the British engineer who had famously set the land-sailing world record of 126 mph on a dry lake bed in California. Jenkins had designed the fixed-wing sail that propelled his Greenbird himself, and having worked in an English shipyard and sailed offshore as well, it was only natural that he’d apply the design to a boat. Tinkering beside Jenkins was Dylan Owens, an American with whom Jenkins developed Saildrone using seed money from Google’s power couple, Wendy and Eric Schmidt. “I think that that what we will see as the platform matures, people will be flocking in and recognizing there is more and more and more purpose for this particular platform. Some of the most exciting and innovative technologies being used on the WhiteSharkVoyage are the saildrones. A Saildrone near its home base in San Francisco. Last summer, three Saildrones completed a joint NOAA/NASA research cruise to the Arctic, transiting the Bering Strait—a first for autonomous vehicles. Saildrone is a robotic craft with a rigid sail and solar panels to charge batteries for steering and satellite communications. Later that day, a boat towed the vessel out beyond Kāne‘ohe bay to continue its journey south toward the equator, a cruise that would last several months. Since then Saildrone has gotten bigger —twenty-three feet—and faster, attaining speeds of eight knots. It has weathered a hurricane in the North Atlantic and measured salinity along the melting pack ice north of the Bering Strait. In September, on a mission for NASA, two Saildrones headed into equatorial waters to test whether they might be useful in forecasting El Niño events. About twenty have been built so far by Saildrone, Inc. in Alameda, California. Rather than being sold like Wave Gliders, Saildrones are hired—deployed and remotely controlled by the company to gather data on behalf of government agencies, universities and other clients at a cost of $2,500 per day. Both Wave Glider and Saildrone can perform fundamental ocean science tasks that must otherwise be done by research ships costing $35,000 per day and up. Marine drones are already supplementing, and might eventually replace, the scores of expensive-to-maintain moored buoys that monitor weather and detect tsunamis. But Wave Glider and Saildrone function only at or slightly below the surface. Taking the ocean’s pulse at depth requires an undersea rover such as Seaglider. At a dockside lab in Honolulu, where the University of Hawai‘i at Mānoa keeps its oceanographic research vessels, electronics engineer Steve Poulos services and operates the three Seagliders UH has owned for a little over a decade. Lying in a cradle is one of the sleek, five-foot-long Seagliders; it looks like a cartoon rocket ship, with a pointed nose, swept-back wings and an antenna for its tail. Originally developed by the University of Washington’s Applied Physics Laboratory, Seaglider is marketed today by Kongsberg Maritime. Some 175 have been sold for around $160,000, plus instrumentation. Seaglider uses changes in buoyancy to dive and create propulsion. Part of its inner hull is an oil-filled bladder that can expand and contract. When it’s floating at the surface, oil is released into an internal reservoir; the bladder contracts, reducing the volume of water displaced by the hull, and the Seaglider sinks. The wings tip it forward, and it dives along a slope of ten to forty-five degrees to a maximum depth of 3,300 feet, recording salinity, temperature, density and other properties along the way. To surface, oil is fed back into the bladder, which increases Seaglider’s buoyancy. It slowly ascends while continuing to move forward. “Every time it’s back on the surface, it phones home,” says Poulos. It raises its antenna, reports its position, uploads its data and checks for new commands via satellite. After a few minutes, Seaglider is ready to dive again, repeatedly for days and weeks. It isn’t equipped with solar cells, but the energy demand on its lithium batteries is so low that typical missions last several months. There are a number of other undersea robots in operation, notably Slocum Glider and Spray, which differ slightly in how they alter buoyancy. A more recently commercialized British wave-powered surface robot, the AutoNaut, has a very different design from Wave Glider. Surface and deep-sea drones sometimes complement each other. At the same time, a Seaglider was used to detect oil pollution deep below. Wave Gliders and Saildrones have both worked to track the movements of large ocean creatures. Marine biologist Barbara Block of Stanford University tracked great white sharks off California with a Wave Glider. Scientists from Dalhousie University have deployed Wave Gliders to track endangered Atlantic right whales off Nova Scotia. Last summer a Saildrone spent weeks following tagged female fur seals in the Bering Sea when they left their pups on remote St. Paul Island to feed. Once, a young seal climbed aboard and hitched a ride (a Saildrone camera captured the scene). In Hawai‘i, Seagliders have become an important tool for UH oceanographers, expanding their reach and providing a more refined picture of the undersea environment. One focus is Station Aloha, an area of deep ocean sixty miles north of O‘ahu. Nearly every month since the 1980s, UH research ships have spent several days there creating an invaluable, decades-long data set. Since 2008, Seagliders have been sent out to the larger surrounding area every few months to record a variety of physical and biological properties at differing depths. These missions, often lasting two months or longer, generate a wealth of basic data in three dimensions and over a prolonged time frame. Wave Glider was conceived by entrepreneur Joe Rizzi, who wanted a device to record singing humpback whales. Rizzi along with engineers Derek and Roger Hine, tested models in aquariums and swimming pools. Benedetto Barone, a UH scientist who specializes in microbial oceanography, relies heavily on Seaglider. He studies biological processes in the sea, such as photosynthesis, and their impact on microscopic organisms critical to the food web. The ocean around Station Aloha is moving almost constantly, as great rotating eddies a hundred miles across or larger sweep slowly past, some churning clockwise, others counterclockwise. “They are the most important motions in the ocean,” Barone says, affecting, for example, sea surface height, which can vary by five or more inches above or below average. This, in turn, has surprisingly strong effects on phytoplankton production even hundreds of feet below. Barone likens these ocean vortices to hurricanes or typhoons in the atmosphere. His computer displays dramatic false-color images of these huge pelagic storms, which Seagliders are uniquely suited to studying. Barone can ask Poulos to program a Seaglider to sail back and forth across the interface between these great eddies for months, weaving a cat’s cradle of survey lines. Each dive uses sensors like the chlorophyll fluorometer to measure the biomass of phytoplankton at different depths in the water column, generating a high-definition, three-dimensional picture of where food production is concentrated. This could never be done from a stationary ship or one cruising through for only a few days. The coming decades will likely see thousands of marine drones patrolling, or holding station, at every watery longitude and latitude. “There is very high demand,” says Saildrone COO Sebastien de Halleux, “and no shortage of countries and populations that have the same questions” about marine science. “Everyone is developing their own niches.